Gurinder Chadha, who previously directed the wonderful Bend It Like Beckham, is giving Jane Austen's Pride and Prejudice the Bollywood treatment. As the director said in an interview with BBC News Online, "Our version may have different cultures and settings but it's still about people marrying from different backgrounds." Chadha's film, which has a budget four times that of Bend It Like Beckham, will stay faithful to Austen's original story for the most part. The Bennett family becomes the Bakshis, and they live in a modest Indian village. Mr. Darcy, who will be played by The Ring's Martin Henderson, is a wealthy American rather than a British socialite. The story starts in the home of the Bakshi's, where the matriarch of the family has set out to find marriage matches for her four gorgeous daughters while a lavish wedding party is in the town. Instantly, this story's version of Elizabeth Bennett, Lalita (Aishwarya Rai) says that she will only marry for love, which naturally causes her mother no end of mental grief. It's not long before Lalita meets the arrogant California snob Will Darcy, and there are instant sparks. 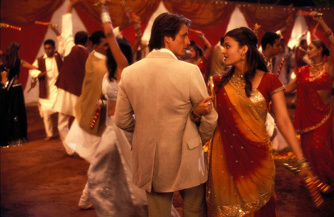 Darcy sees Lalita as a naïve, small-town Indian beauty, and she sees him as off-putting and haughty. The pair varies from finding enchantment in each other's company to being suspicious of their motives. Though Lalita and Darcy's budding romance nearly falls prey to assumptions, back-biting gossip, and various coincidences and comedies of errors, pride and prejudice are both overcome so that love may conquer all in the end.